The mystery you love to solve again and again is even more intense! Clue game is back with a modern twist: a soiree at a millionaire mogul's mansion turned deadly, and you must find out who is responsible for murdering the host. There's no Revolver or Billiard Room this time, but could it have been Scarlet with the Barbell in the Spa? Open up the tabloid-style instructions to get the scoop on the updated rooms, weapons and guests. A deck of Intrigue Cards adds suspense to your game with cards that can help you solve thet crime faster or result in a second victim! Gasp! Narrow down which rumors are ture and which are just hearsay - and get caught up in the scandal of the century! Clue game is back with a modern twist. Features updated rooms, weapons, guests, and a deck of intrigue cards that add suspense to the classic murder-mystery game. 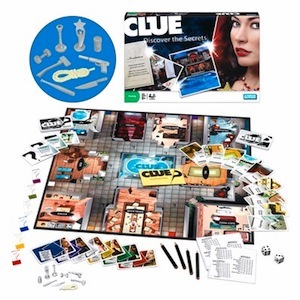 Includes gameboard, 6 guest movers, 6 personality cards, deck of rumor cards, deck of intrigue cards, clue pad, scandal envelope, 2 dice, 9 weapons, and instructions. For 3-6 players. Ages 9 and up.